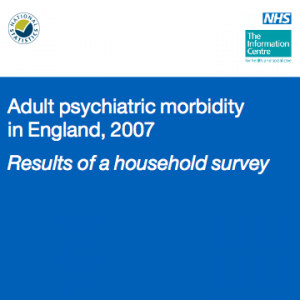 The Adult Psychiatric Morbidity Survey (APMS) series provides data on the prevalence of both treated and untreated psychiatric disorder in the English adult population (aged 16 and over). The 2007 survey is the third in a series and was conducted by the National Centre for Social Research in collaboration with the University of Leicester for the NHS Information Centre for health and social care. The previous surveys were conducted in 1993 (16-64 year olds) and 2000 (16-74 year olds) by the Office for National Statistics, and covered England, Scotland and Wales.